Merry Christmas to all! Or god jul, as they say here. 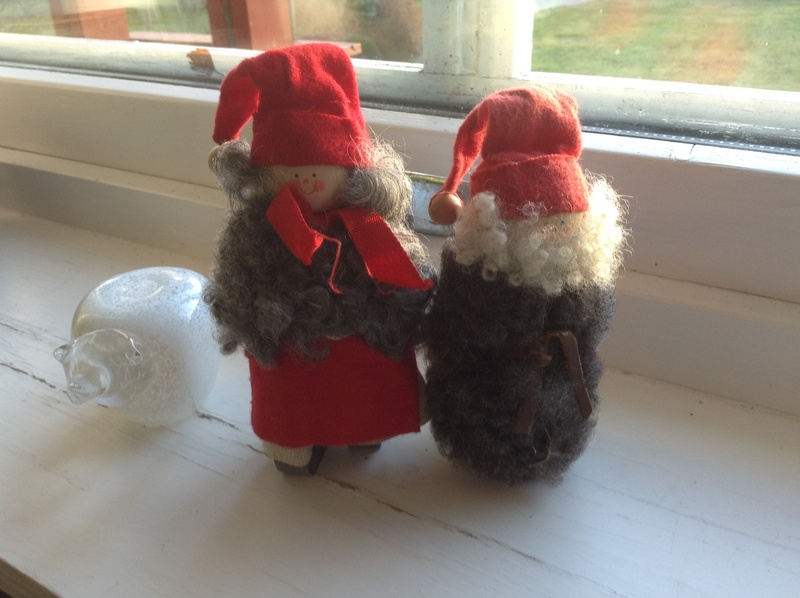 I am home for the holidays, enjoying a Norwegian Christmas on the family farm. No snow yet, but very hyggelig, with candles, clementines, cooking and knitting and lots of relatives, with endless cups of coffee. We have decorated the tree, wrapped presents, and today is lille julaften, little Christmas Eve, the “day before the day”. Christmas Eve is our main day of celebration. Rice porridge for lunch, with a hidden blanched almond: whoever finds that, wins the marzipan pig. Presents are opened after dinner. What dinner is varies by geography and taste: pork, lamb or mutton ribs, salt cod. Here, it will be roast pork, with sauerkraut, mushy peas and potatoes. It is all very, very traditional. It is just lovely to see parents, siblings, nieces and nephews, aunts and uncles. Still, having been abroad for years, it is always a little strange coming back and realising how home is neither here or there, but several places. Being slightly foreign in what was your own country is always a tad disconcerting; the reverse culture shock still surprises me. 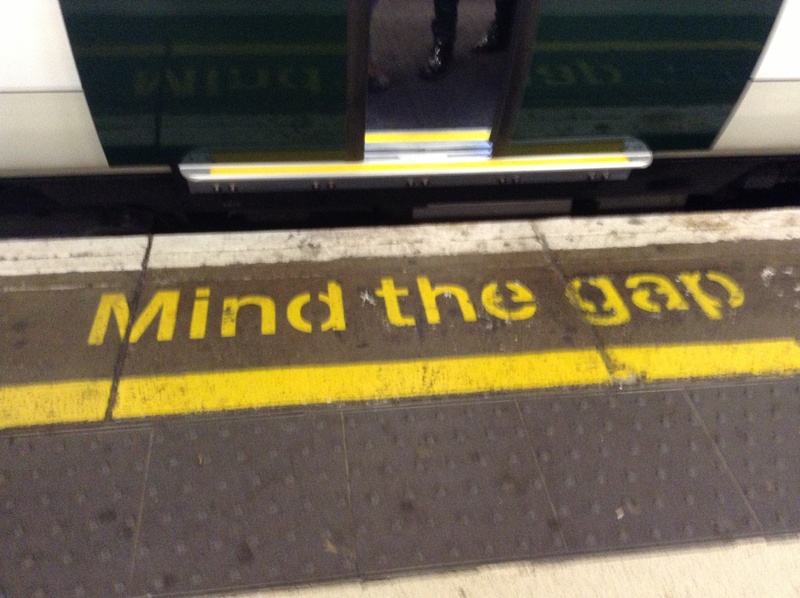 The topical jokes that I miss, the nuances of politics, small family updates that never made it to email. Still, it is a privilege to be able to share another Christmas with everyone, and I am very grateful for that. Wishing you all a very god jul, Merry Christmas wherever you are! Thanks so much for sharing your stories, recipes and generosity this year. I really appreciate it. 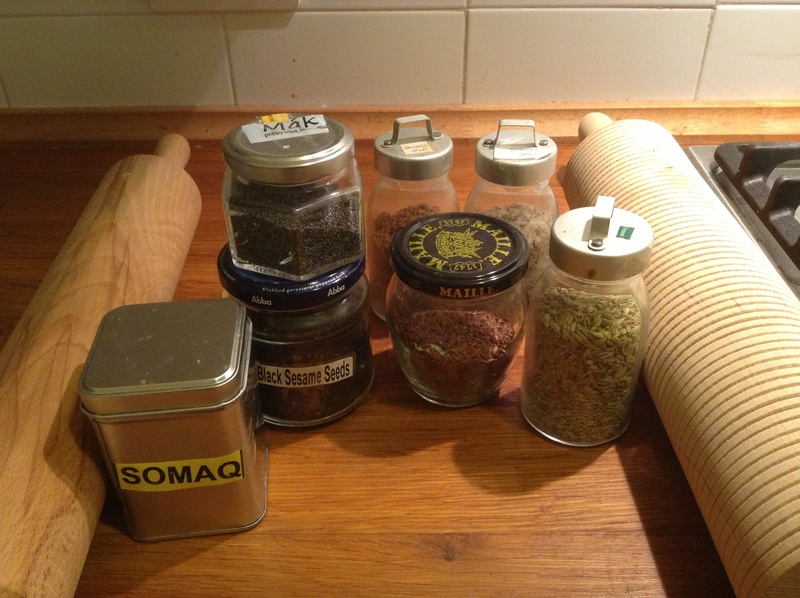 This entry was posted in baking, food, travel and tagged expat, Norway, Norwegian on December 23, 2013 by krumkaker. 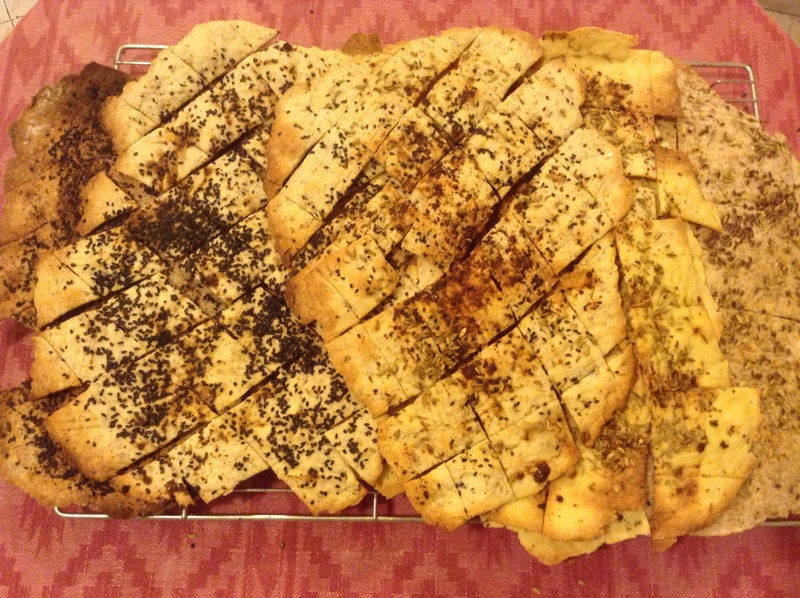 Topping: 2-3 teaspoons, mixing a couple seeds and spices you have and like, for example, sesame seeds, cracked pepper, flax seeds, fennel seeds, sumac, poppy seeds, rosemary, smoked salt. Heat the oven to 225C/ 450F. 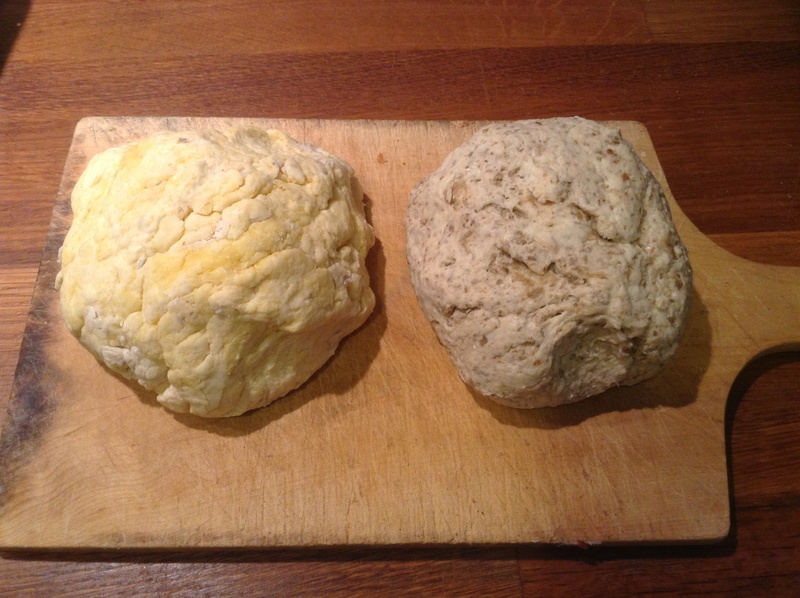 Mix flours, water, salt and olive oil until you have a nice lump of dough. Let it rest for a few minutes. 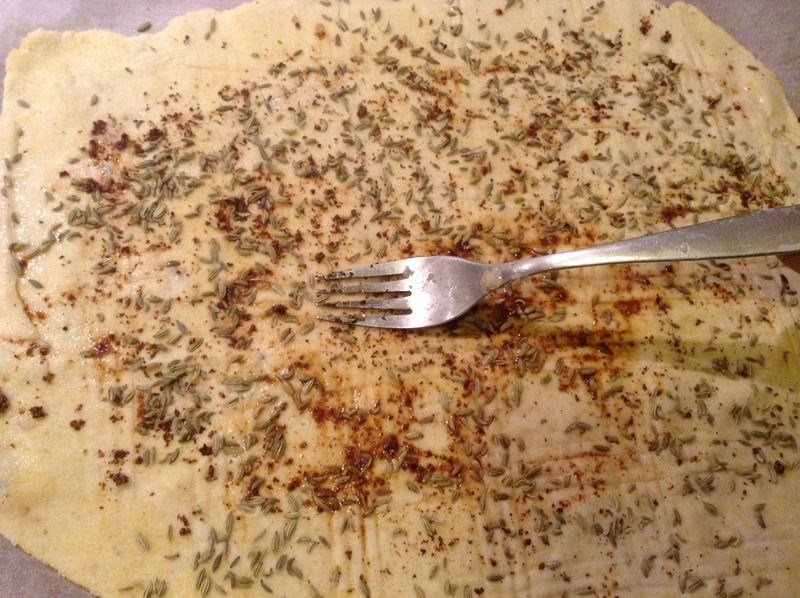 Then divide the dough in two, and roll it out, as if you were rolling out a thin pizza base. You may need a little flour. I roll it out straight onto baking paper. Sprinkle with a little water, then top with seed or spice mixture of your choice. Plain coarse salt and pepper is great too. 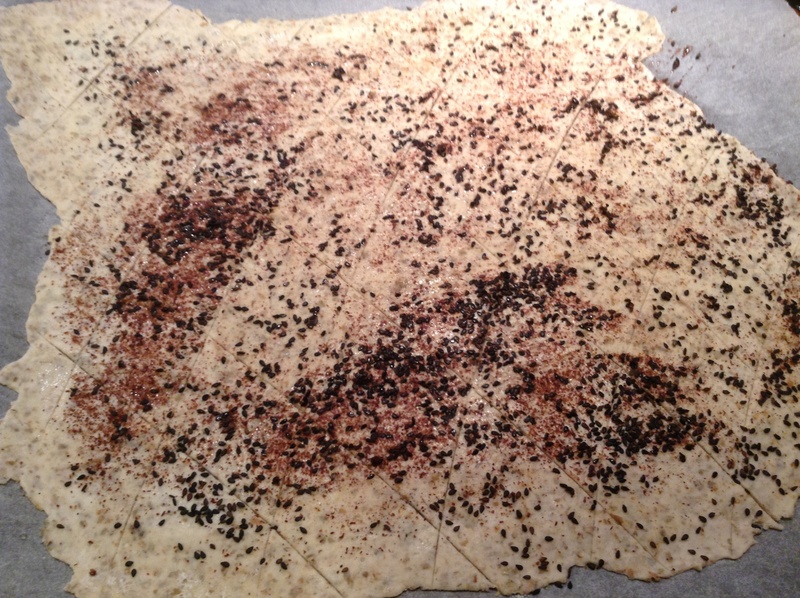 I usually sprinkle a little more water on, then run a fork lightly over the dough to make the seeds adhere. Otherwise they fall off a bit too soon and can be messy when eating them. See what works for you. Cool on a rack, break carefully apart and enjoy! 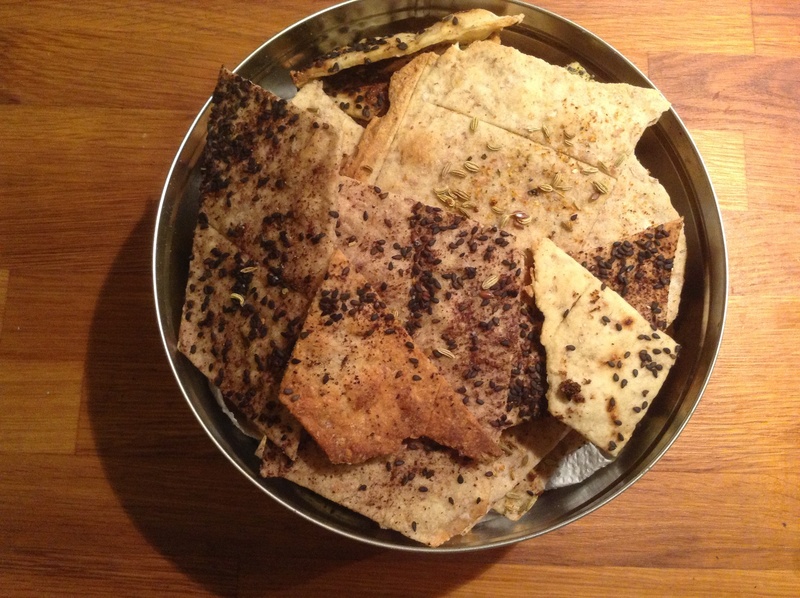 These keep well for a month, are very inexpensive to make, and are nice as a gift, for when unexpected guests pop by, or just for yourself after post-work drinks when you cannot be bother to cook a proper dinner: cheese and flatbreads might be just what you fancy. Happy continued relaxing holiday countdown to all! 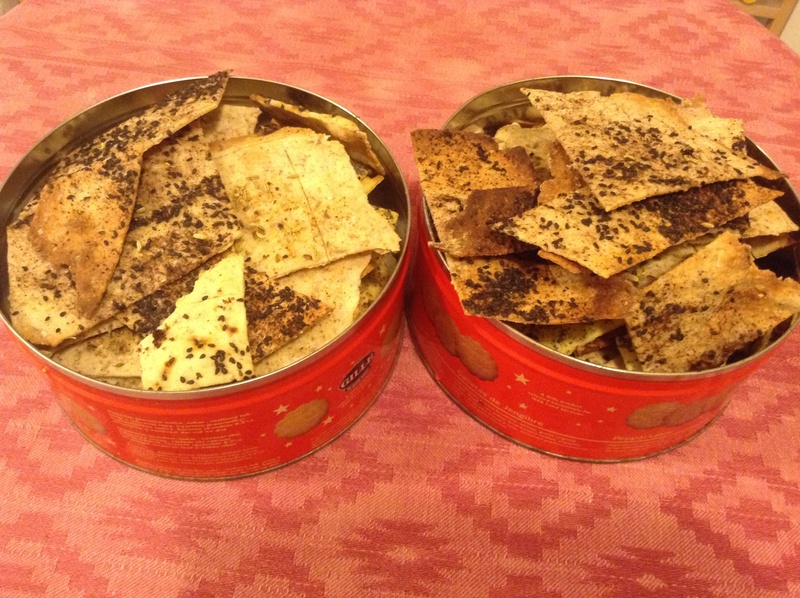 This entry was posted in baking, food and tagged crackers, flatbread on December 22, 2013 by krumkaker. 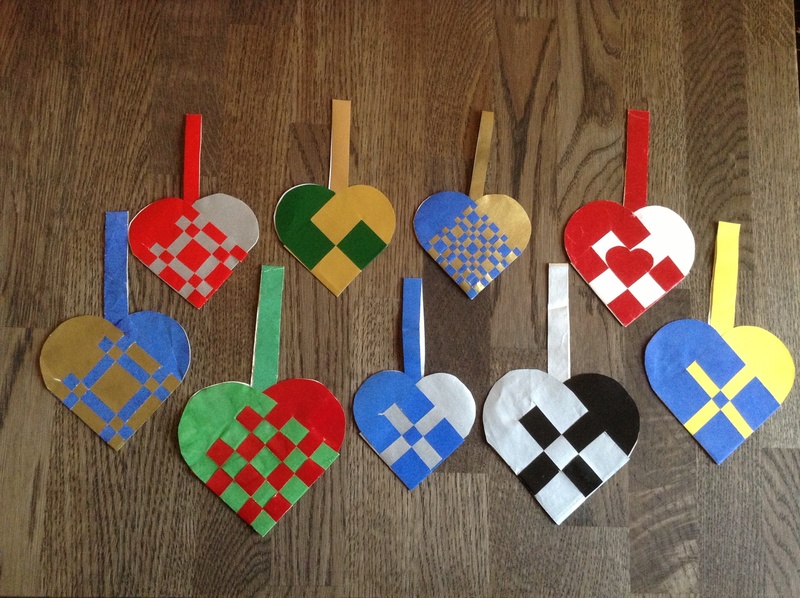 Christmas preparations and traditionals are such a reminder of cultural differences. Most of us carry Christmas preferences from home: what to eat (fish, turkey, smoked lamb ribs, pork or nut loaf? ), which cookies to bake, which day to celebrate on. We usually alternate Christmases in England and Norway, so we tend to mix and match the traditions we like: purple candles for a Norwegian advent wreath, and clementines studded with cloves to count down the days; Italian pandoro (and red underwear for New Year’s Eve for for good luck, also an Italian tradition), German lebkuchen; and of course, English Christmas cake. Every year in November my English mother-in-law calls to ask if we would like a Christmas cake, and every year my husband says to me “You know I don’t eat that…..” But I do like them, and happily say yes to her Christmas cake, which she will already have baked weeks ago and fed with brandy since. It is a) a small step to bridge the cultural gap and b) rather delicious. Our cake, with brandy. 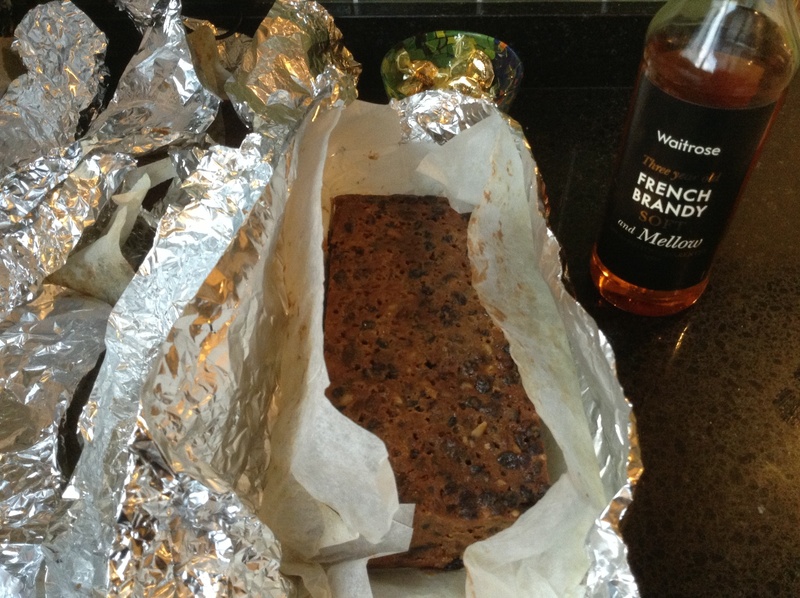 She spoons a little brandy over the rich fruitcake regularly after baking (feeding it). It is made with Delia’s recipe, but she soaks the fruit in brandy for at least a week before baking. I was taking notes as she explained. 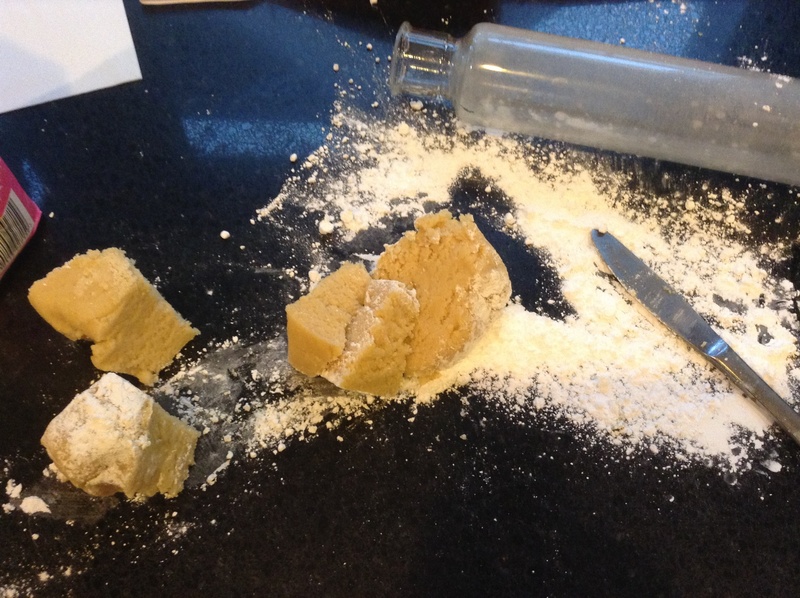 As we were over to see them in London before the holidays, we made marzipan icing from scratch for several cakes. New experience for me. Here we are beating eggs and sugar over boiling water, 7-8 minutes. 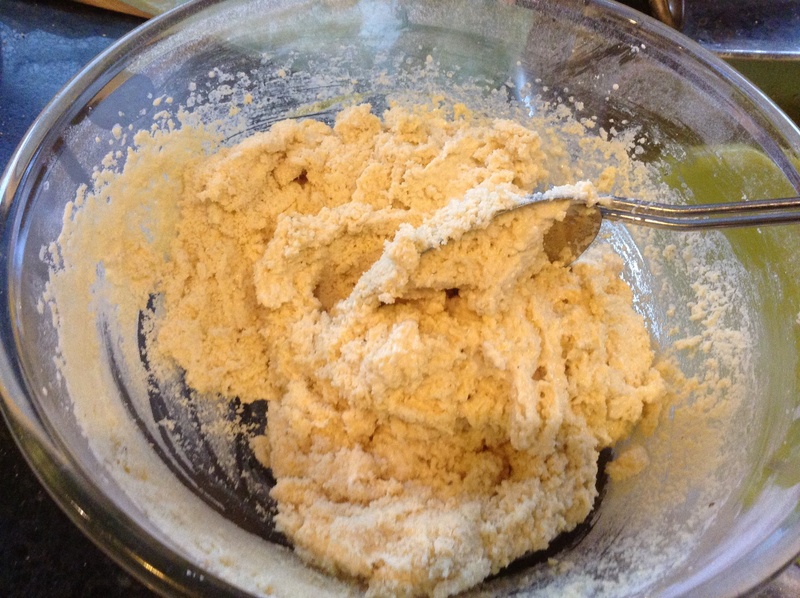 ….. Then we added the ground almonds, brandy and almond extract and kneaded it. This made enough to cover two cakes. Impressive marzipan! Yes, much easier to buy the marzipan, but this was rather fun. 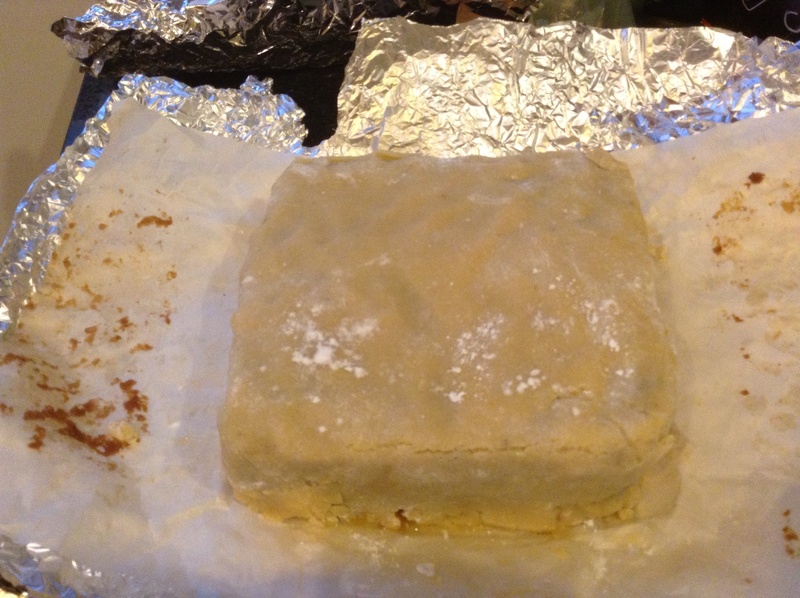 The marzipan was rolled out with icing sugar. Another slight deviation from Delia: my mother-in-law brushes the cake with apricot jam before the cake is wrapped in marzipan icing layer. As you see, the cake survived the flight. 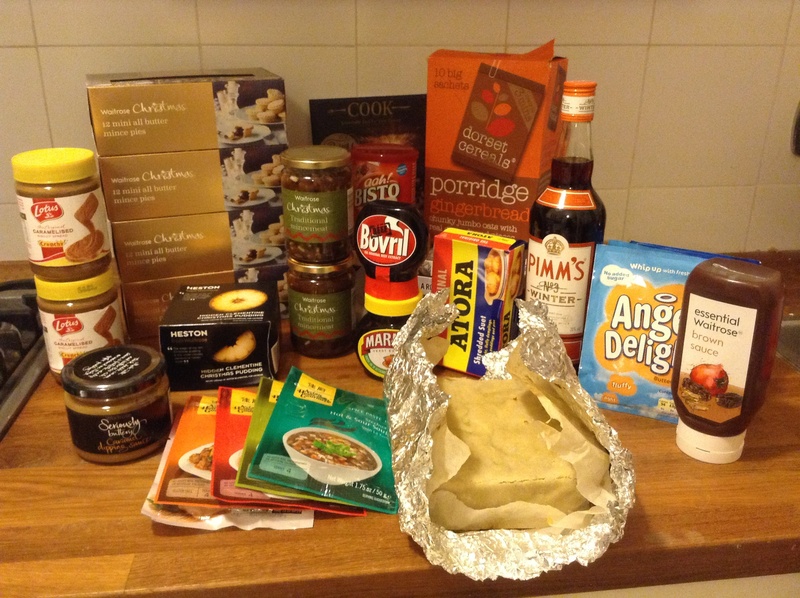 And so did the treasure trove of British food: mince pies, crumpets, suet, Bovril, brown sauce, winter Pimm’s, mincemeat, Marmite, Christmas pudding, cheddar, porridge oats…… Yes, you can even carry mince pies in your hand luggage! Wonderful as Italian cooking is, a little British food is very nice indeed. 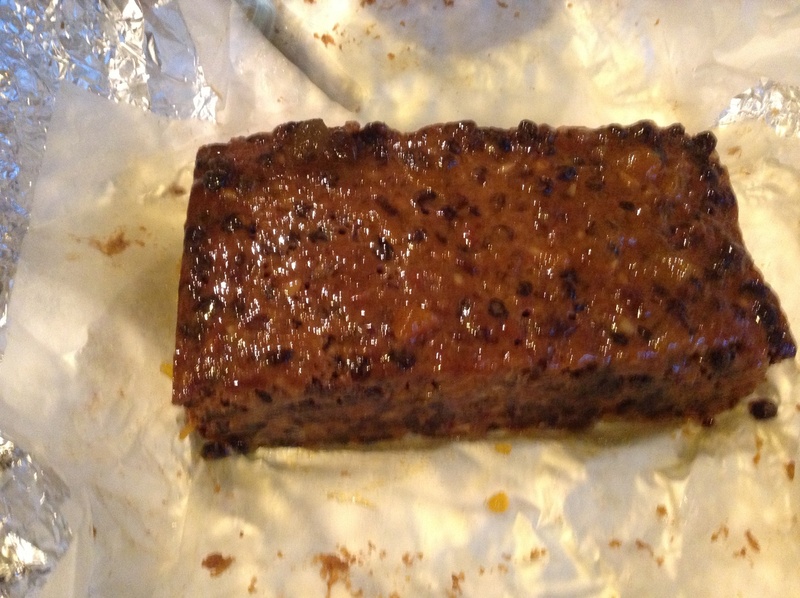 And if I can just get our Christmas cake iced soon, all will be well……. 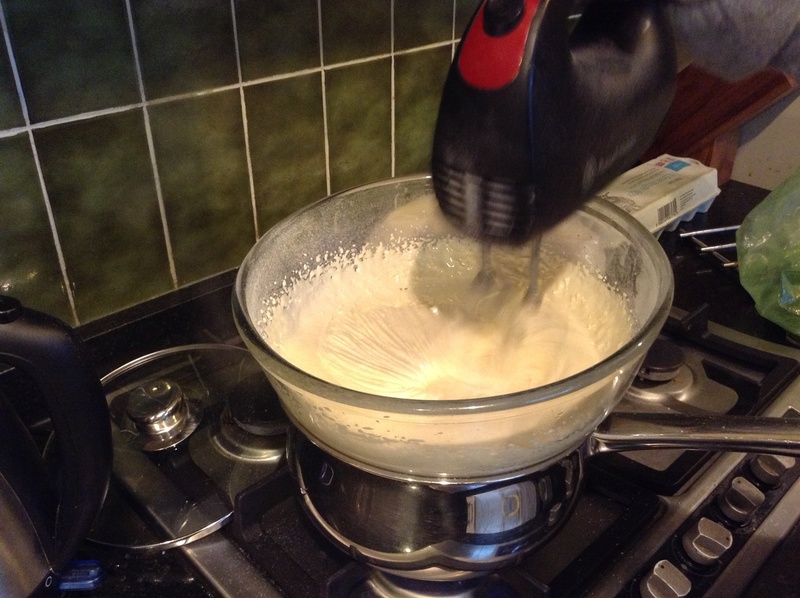 This entry was posted in food and tagged British, cake, food shopping on December 20, 2013 by krumkaker.